Every month I try to bake along with Zorra’s Bread Baking Day and with the Bread Baking Babes as a Buddy. For more than a year I baked almost every month, but my health almost spoiled it for this month. I just baked delicious bread with Thai vegetables and Chiang Mai sausage for Bread Baking Day #50. I was ready to start with Sheperds Bread when my foot started to hurt. So much I couldn’t walk. Then I remembered last year I got gout for the first time in my life. So this was the second time and I had this enormous pain in my foot. When things pass, like they always do, they also pass from my mind. So I had forgotten all about gout,the pain and the diet. I’m terrible with diets anyway. But, now it was back again. I stayed away from the kitchen for a few days. Peter ordered me to keep off my feet so I would be back on my feet sooner. I had all the time to have a good look at all those nice blogs about bread and food. I thought I couldn’t join the Babes this month, but today May 28 I decided to give it a try. The number of loafs in the freezer is getting low and we need to eat, don’t we. Today I felt a bit better and started to walk with care. Karen found a beautiful looking loaf in the book Bread for all seasons by Beth Hensperger. It’s baked in a pot. I love baking in my ceramic pot; the loaves rise beautifully because of the hot ‘pot-spring’. The only thing is they all kind of look alike. But, today I’m baking in my pot as a Buddy with the Babes. Dough: machine mix 4 minutes, knead another 5 minutes, rise 2,5 – 3 hours, pre-heat oven, shape; mix 1 minute with extra flour, score, place in covered pot and proof 15 minutes, bake 10 minutes with lid and 30 minutes without lid, let cool for 15 minutes. For the sponge: I added all ingredients in the mixing bowl and with the paddle mixed until very well combined. Cover the bowl with a plastic bag and leave for 2 hours. I added all ingredients, except the flours, in the mixing bowl and on low speed I added the flour until completely combined. This took around 4 minutes. Then I mixed the dough on medium speed for another 5 minutes until it was soft en cleared the sides of the bowl. I place the dough in a floured deep container, dusted the top with flour, and covered with plastic lid. I let it ferment at hot room temperature of approx. 32°C until it tripled in bulk. This took around 2.1/2 - 3 hours. In the mean time pre heat the oven at 220°C. Because proofing takes about 15 minutes only. Here comes the part I was surprised, the pot is not pre-heated in the oven. I turned the dough on my work counter. It’s full of bubbles and slightly sticky from the long rise. I gently formed it with my dough cutter. I forgot to knead in about 35 gram flour to make firmer dough, about 1 minute. I shaped it into a tight round ball. I also forgot to mist the surface with water. I scored the loaf and then remembered to dust the top heavily with flour. That’s the third thing I forgot, that will do for now. I sprinkle the pot with flour and placed the dough ball in the center of the dish. Placed the lid on the pot and left it to proof for 15 minutes. Rinse the lid with water and I took the excessive water off, and again placed the lid on the pot. I place the pot in the hot oven. I baked the loaf for 15 minutes with the lid on the pot and another 30 minutes without the lid. Pot-spring! I love that! Your bread looks so yummy. I agree that the breads look similar when baked this way but I really enjoy the crust and somehow it gives flavour as well. 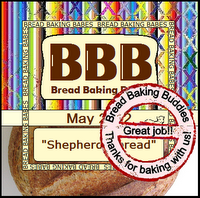 Thanks for baking with us, your Buddy Badge is on it's way! I do hope you feel better now. Thanks Karen, the sponge definitely gave the bread extra flavor. I do feel a lot better now. But is just like "no kneading bread " is it?? the dough for this loaf is regular (kneaded and shaped). This makes it a kneading bread for me. ;-) pot spring ... and it does indeed! I'm with you 20 g of sugar is plenty. I really don't see why there's any; but I'm just bad that way. Diet's and forgetting: Slowly, I'm learning but it usually takes 5 or more times for something to happen before I really get the association and remember what I'm suppose to so I fully understand your forgetting the gout thing last year. Here's to your being a faster learner than me. Delighted you felt better and felt like baking with us again. maybe next time I bake this one without sugar, don't think this loaf needs any. I probably would learn faster. Poor you!! Diets are NO fun. I'm so glad to hear that you are feeling better. I'm selfishly glad too because we get to see your beautiful cast iron casserole dish AND that gorgeous bread. Thank you for baking with us. I would have been so happy finding a cast iron casserole dish, but I couldn't find a affordable one. But this ceramic pot is great for baking bread in the oven and making other nice dishes. And we found it for around 2 euro! Hi, This is my first time visiting your blog. It is very interesting to see you baking all these European style breads in Thailand and I think all your breads look amazing! Being your latest follower, I would love to be back for more of your baking in the future. thanks for visiting my blog, hope to see you often. I visited your blog; you make great and delicious treats. I will be back for more. hope you are feeling good today. my husband has gout, so I know it can be terribly painful. Hi Barbara, if you have a cast iron pot you have the best. I think my ceramic pot comes close. Be careful when you pre heat the pot, it's sizzling hot. I use apple vinegar cider every day now to reduce the uric acid. Just mix a table or tea spoon with water and drink, makes your face look very funny.